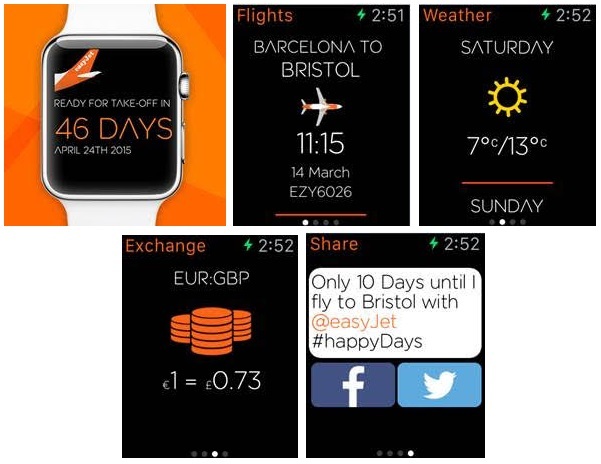 easyJet has designed a bespoke app for the Apple Watch which will be available for the launch of the long-awaited new wearable technology on April 24th. In addition to its precise timekeeping functionality, Apple Watch has been designed to offer personalised notifications for passengers with industry experts believing that one of the most exciting aspects of the wearable technology will be its ability to give users key information in a simpler and more accessible way. It will be available in five languages from launch. Glances, another key feature of Apple Watch, will inform and remind passengers of key parts of the journey. This includes pre-departure information, check-in detail, up-to-date local currency exchange rates, weather in destination and real time flight status - building upon the success of easyJet’s popular flight tracker tool. It will even show the user when it is time to board the aircraft with a handy countdown function. These helpful notifications will be sent directly to Apple Watch with the user feeling a gentle tap upon receipt. Passengers will also be able to tweet and post to Facebook at various stages of their trip directly from the watch face. This could include countdowns to departure as well as sharing destination weather.